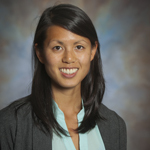 Dr. Lindsay Soh used a Digital Humanities in the Classroom Grant to develop a class project in her Spring 2017 course “Chemical Engineering 370: Alternative Energy Sources.” In this course students are introduced to how to compare different energy technologies based on a number of different metrics. Read on for her reflections on the semester! The idea of my Digital Humanities in the Classroom project was to communicate how an energy technology works to the general community and allow for greater understanding of the course metrics using data visualization. Specifically, the students’ project involved research into a chosen renewable energy technology. The students first underwent literature-based research to understand the technology’s fundamentals. Next, they were asked to find and interpret data related to the technology in order to gain a deeper understanding of the feasibility of the energy source. 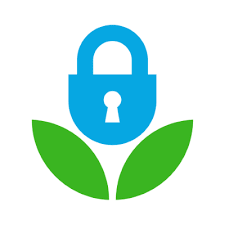 The project consisted of a comprehensive report of the renewable energy technology that also incorporated how to communicate the findings with the general community. As such, the digital project included a visualization of the major findings that could be expounded from the data set and as related to the course metrics. Using the data analytics platform Tableau, students created public sites that provided a context and story for the visualization. This resource is being made available to the Nurture Nature Center as a possible tool for their energy education program, and the public sites are also being posted on the my website. How to find and build data sets? 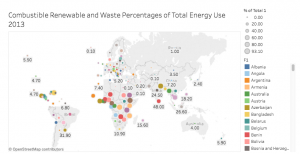 How to use Tableau software for the final project visualization? Upon reflection, I think that the integration of DH aspects into the course was largely successful. It has been my goal since coming to Lafayette College to provide students with the tools necessary to better communicate fact-based arguments. This project has served multiple purposes, allowing the students to explore a particular research question as well as develop ways to use data to explore a novel research question and communicate the findings. The basic structure of the project worked well for these goals, however one shortcoming became apparent in the final products – the students were not able to utilize the data visualization software to its full abilities. For example, while the graphics that students produced were visually appealing, they were limited mostly to two variable comparisons; the beauty of data visualization is in the ability to elegantly intersect 3 or more variables to tell a different the of story with the data. I think that adding an extra deliverable would aid in this objective. 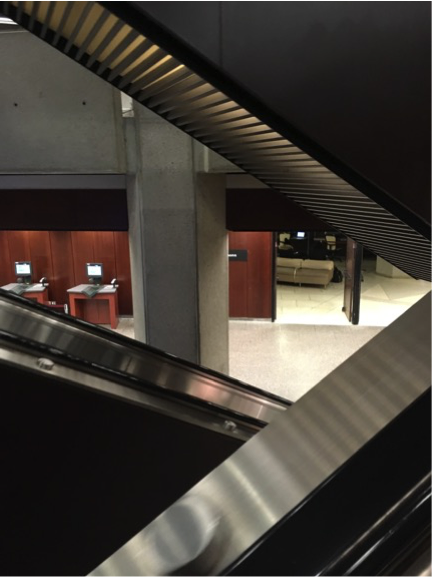 NCC (the North American Coordinating Council on Japanese Library Resources) hosted a conference with the University of Toronto Libraries called Doing Digital Scholarship in Japanese Studies: Innovations and Challenges in mid-March. 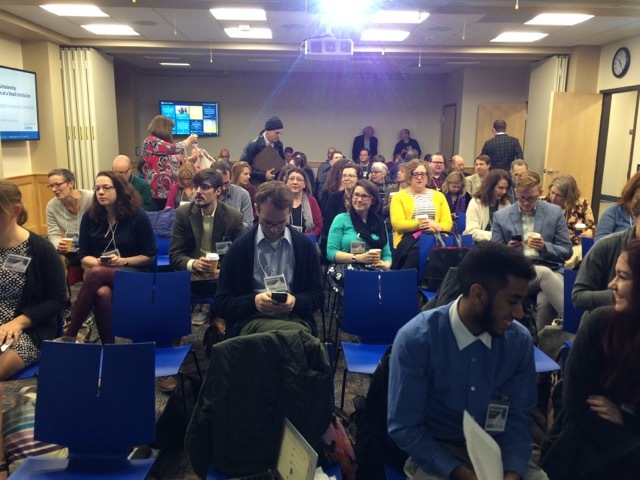 I was asked to give two short talks – one focusing on creating digital collections with students and partners, and one about using digital projects as a teaching tool in undergraduate learning. Conference speakers included university librarians, faculty and CLIR postdoctoral fellows, describing their differing approaches to digital scholarship. Tokyo Metropolitan University professor Hidenori Watanave gave the keynote presentation, demonstrating a number of creative and interactive archive building projects he has been developing. Watanave’s projects group videos, photographs and data associated with people who experienced some of Japan’s most devastating disasters – the nuclear bombings of Hiroshima and Nagasaki and the battle of Okinawa in 1945, and the 2011 Eastern Japan Great Disasters. 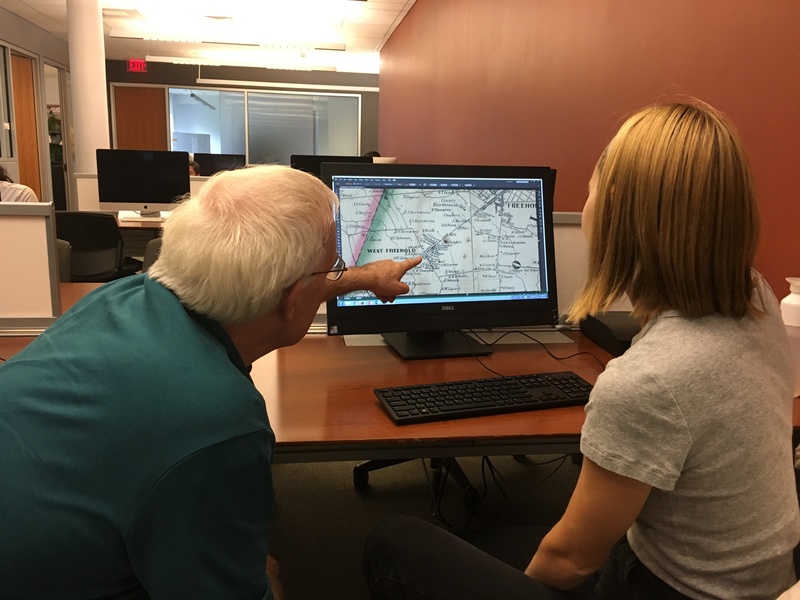 Visitors to Watanave’s archives can navigate maps to access the movement of people over time, watch video recordings of their stories or interact with other archival resources. Watanave is developing phone apps that use artificial reality (AR) to provide the same experience for visitors to these cities in real-time. 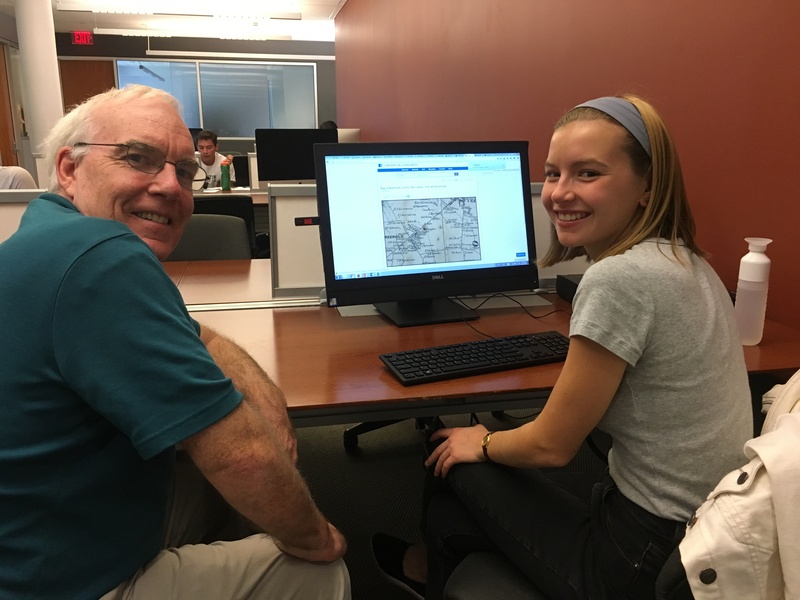 Other digital scholarship sessions featured innovative map projects, local history work and a comprehensive scholarly image organization system. The hand of the archivist and one photograph of many in the archive in Japan. I also visited Japan, where I negotiated the building of a digital archive. 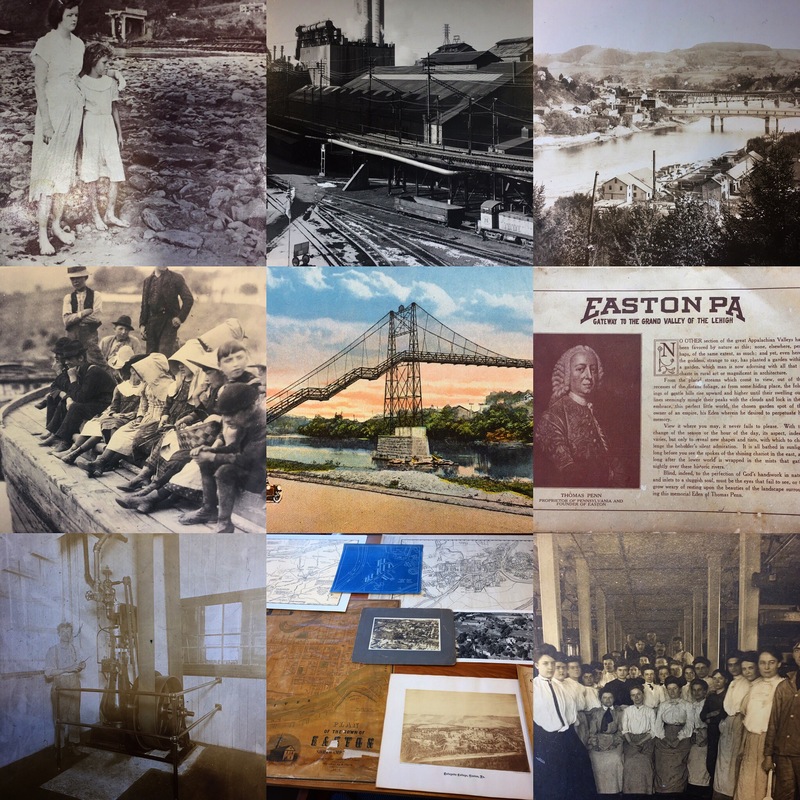 The project aims to digitize tens of thousands of objects, photos and documents collected over a 70-year period. 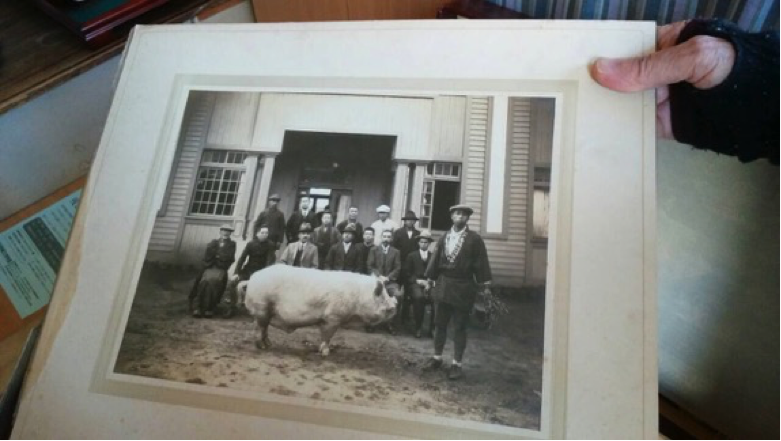 The collection features evidence of the pervasive military culture in Japan in the 1930s, but also preserves documentation on local history and governance, folklore, religion and festivals, family life and economic change. The digitization project will commence July 2017. Last, I attended the Coalition for Networked Information (CNI) conference held in Albuquerque. Concurrent with the CNI conference, I attended the Council on Library and Information Resources (CLIR) mid-year conference, which included targeted sessions for fellows on grant writing, project updates, career mentoring, and the creation of small group projects. Time spent reconnecting with others in the cohort fostered collaboration on various aspects of our postdoctoral projects. My thanks to the Andrew W. Mellon Foundation, NCC and CLIR for providing generous support for these learning opportunities. A postcard image among those recently added to the East Asia Image Collection. The East Asia Image Collection (EAIC) has just added 453 picture postcards to its open-access database. These items range from “Yellow Peril” genre Russo-Japanese War cards from Europe to Japanese photo-journalism of the 1930s invasion of China. The collection also contains vistas of “Manchuria,” scenes from everyday life during wartime, and military-humor manga postcards. The EAIC is a collaboration between Paul D. Barclay, Associate Professor of History, and Digital Scholarship Services. Visit our open-access archive digital archive including picture postcards, high-quality commercial prints, and colonial era picture books, among other unique materials. Dr. Amir Sadovnik presents on his teaching as a Digital Humanities in the Classroom grant recipient. 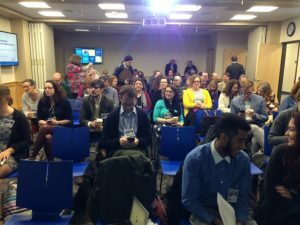 When we talk about the digital humanities, often we’re thinking about how digital technologies can be applied to humanistic inquiry and pedagogy. But Amir Sadovnik, Assistant Professor of Computer Science, is interested in how humanistic concerns and questions can enrich introductory studies in computer science. 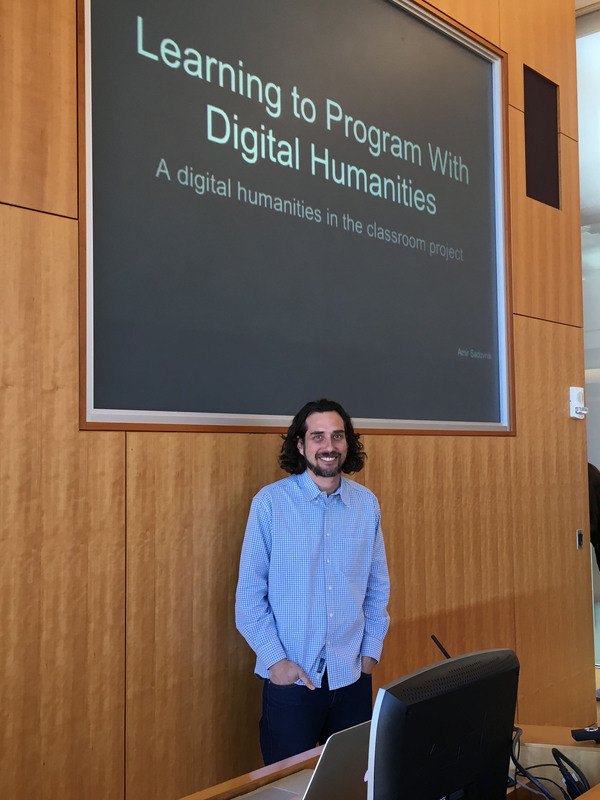 On March 22, Dr. Sadovnik gave a presentation on his teaching as a grantee of the Skillman Library Digital Humanities in the Classroom program. In Dr. Sadovnik’s “Intro to Computer Science” courses, students learn the essentials of programming. 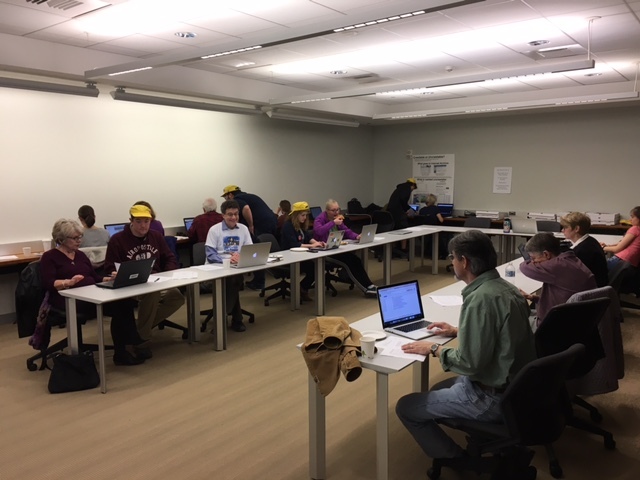 Most students enter with no programming experience; over the course of the semester, they build the skills to program a tool to analyze data sets consisting of, for example, Lafayette College Yik-Yaks, or candidates’ Tweets from the 2016 presidential election. Sadovnik explained that in his traditional introductory computer science course focused on digital media computing, students learned to develop and implement algorithms for final projects such as basic sound and image editors. 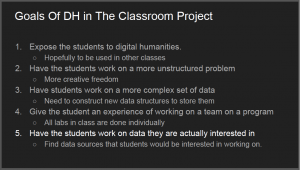 A slide from Dr. Sadovnik’s presentation, outlining the goals of his DH in the Classroom project. With his Digital Humanities in the Classroom grant, Sadovnik aimed to make the leap from digital media processing to analysis. His teaching goals included: challenging students to construct more complex data structures in order to accommodate more complex data sets; providing students with the experience of working on a development team, as preparation for the workplace; and providing students with opportunities to work with data sets that interest them. 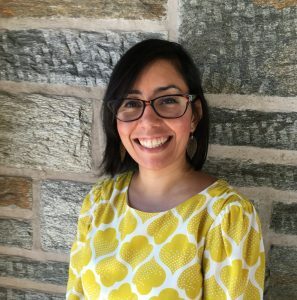 Dr. Sadovnik’s thinking was that if students could work with data that connect with their multidisciplinary research interests in history, political science, sociology, and other areas, they would connect more meaningfully with the programming tasks at hand. 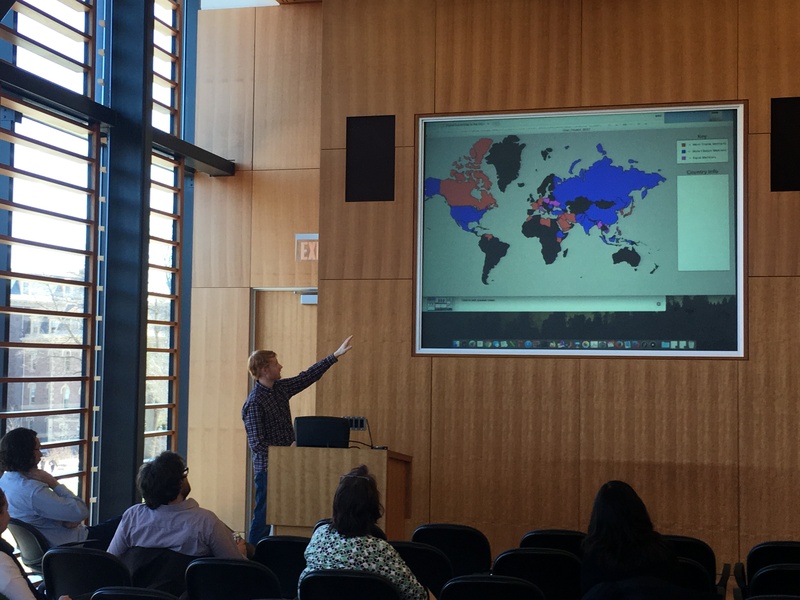 Student Mike Van Ness presents a data visualization produced by the tool he programmed in Dr. Sadovnik’s class. 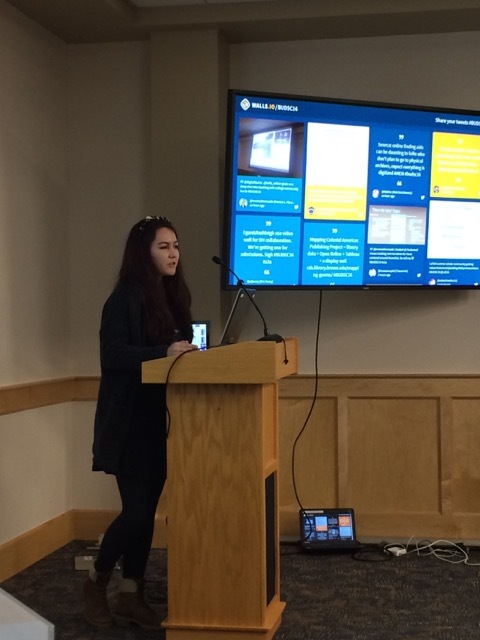 Student presenters who had taken Dr. Sadovnik’s courses also offered their reflections on the DH in the Classroom experience. Shira Wein, Wassim Gharbi, and Mike Van Ness showcased their work from the class. All of the students testified that working with complex, meaningful data enhanced their introduction to computer science. Thank you very much to Dr. Sadovnik and his student co-presenters for sharing their important work! This spring, Data Visualization & GIS Librarian John Clark will offer two workshop opportunities for students and faculty to learn about critical cartography. 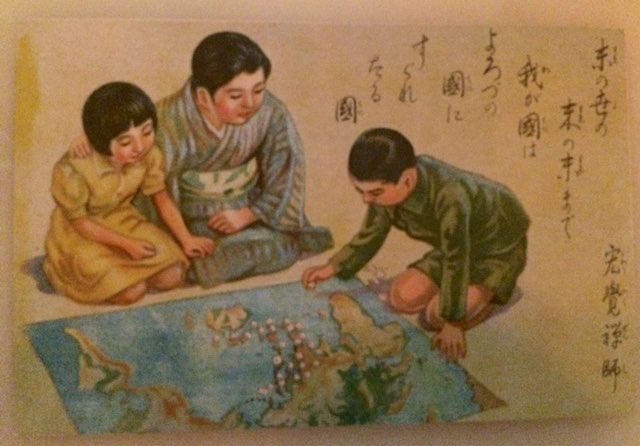 Reading a map is trickier than you might expect. While maps casually present themselves as a visualization of reality, the truth is, all maps are imperfect models of natural and cultural features on the surface of the Earth. 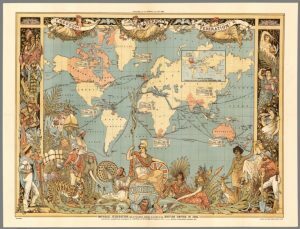 Reading a map involves understanding how a map maker has chosen to represent these features and, perhaps more importantly, what s(he) has left out. 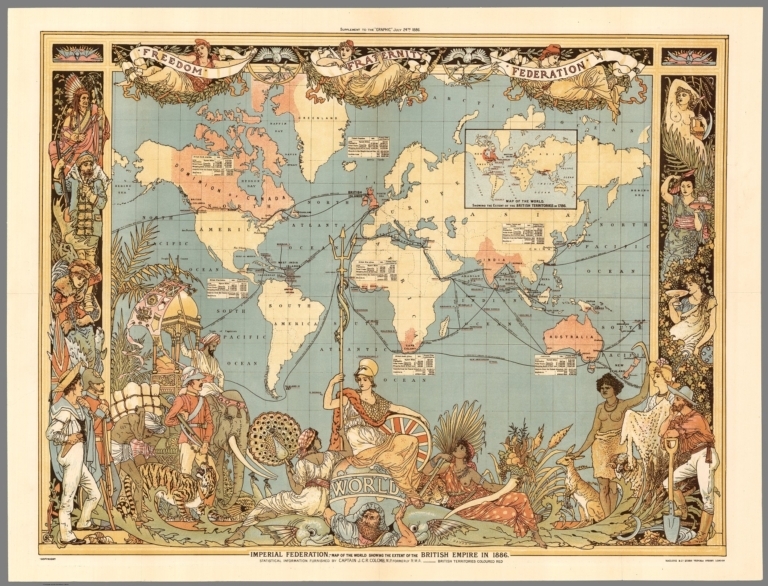 Join for a guided tour through a variety of different historical and contemporary maps as John explains some common principals used by cartographers. Participants will then have an opportunity to make a map using Social Explorer, an online mapping tool available to the Lafayette community through Skillman Library. This event is being offered twice, Wednesday, February 1st and Friday, February 3rd, from 12:15pm to 1:00pm. Please RSVP to John Clark at clarkjh@lafayette.edu and indicate if you would like to attend the Wednesday or Friday event. Lunch provided. DSS recently welcomed James Griffin as the new co-Director for Research and Development. James joined DSS in the position of Digital Library Developer in 2012, and the team at Skillman is thrilled that James agreed to step into this new role. Motivated by an interest in digital preservation and scholarly communication, James is deeply involved in the application of open source technologies within libraries and archives. 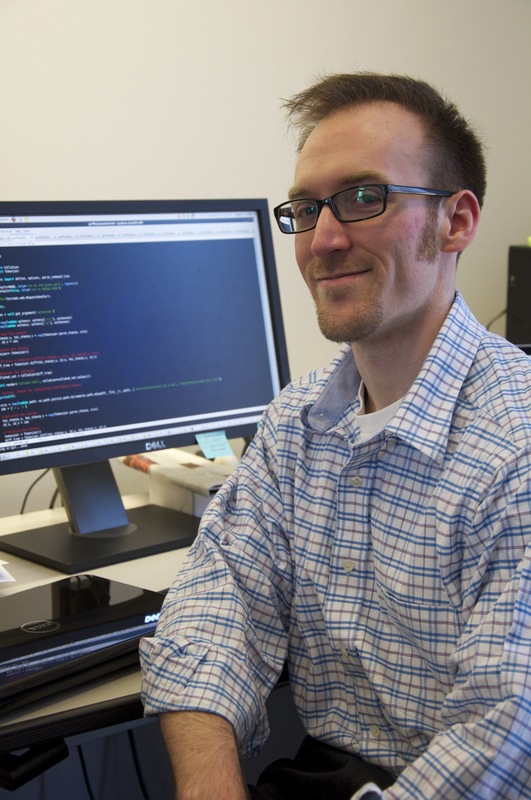 James’s research interests focus on the semantic web. He aspires to expand the usage of linked data beyond the domains of digital preservation and curation. He is also intrigued by the potential for Development and Operations (DevOps) service management methodologies to increase durability and performance in technical infrastructure. Since joining DSS, James has worked on implementing Islandora, an open-source digital asset management framework. He has also collaborated with faculty on the Swift Poems Project, the East Asia Image Collection, and the Easton Library Company Database Project. Since 2015, James has been exploring how linked open data may be further integrated within the digital repository architecture for DSS. He is Skillman Library’s liaison to the Project Hydra community. In his new co-Director role, James will continue to collaborate on faculty projects and lead the migration of DSS digital assets to the Hydra repository solution. James is excited to execute a vision for DSS anchored in the values of open-source collaboration and digital library preservation. Congratulations, James! Guest-blogger Will Gordon ’17, one of the Skillman Library 2016 Digital Humanities Summer Scholars, reports on a successful presentation at the Bucknell University Digital Scholarship Conference. Last Friday, I piled into a van with four of my friends and fellow digital humanities scholars to drive to Bucknell University to present our undergraduate research and learn more about digital humanities. 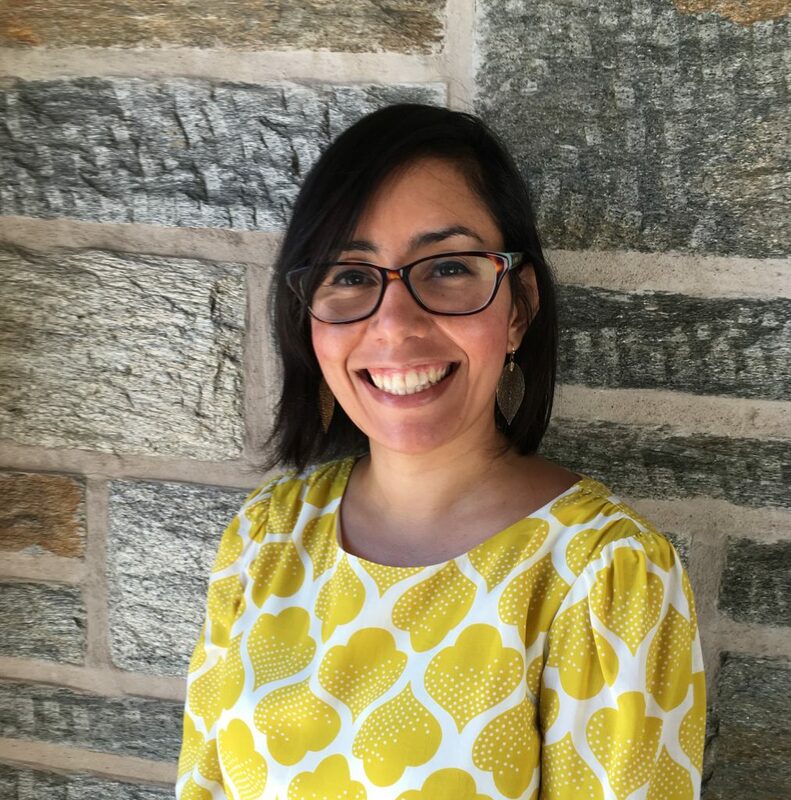 Research and Instruction Librarian Sarah Morris, who is also the leader of the Digital Humanities Summer Scholar Program at Lafayette College, drove us to the Bucknell University Digital Scholarship Conference (#BUDSC16). Tawfiq Alhamedi ‘17, Caroline Nawrocki ‘18, Mila Temnyalova ‘18, Johnny Gossick ‘18, and I were all part of the summer program, in which we each designed, researched, and realized our projects. Now it was time to present our projects to a crowd of undergraduates, graduate students and academics through a panel session and electronic posters. Dinner and the keynote speech from Assistant Professor of Sociology at Virginia Commonwealth University Tressie McMillan Cottom filled the first night. 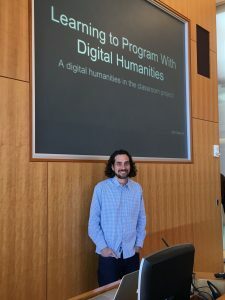 We learned about incorporating the digital humanities into a sociology graduate program, and saw ways to pursue these interests after graduating from Lafayette. It was our turn to present the next day. 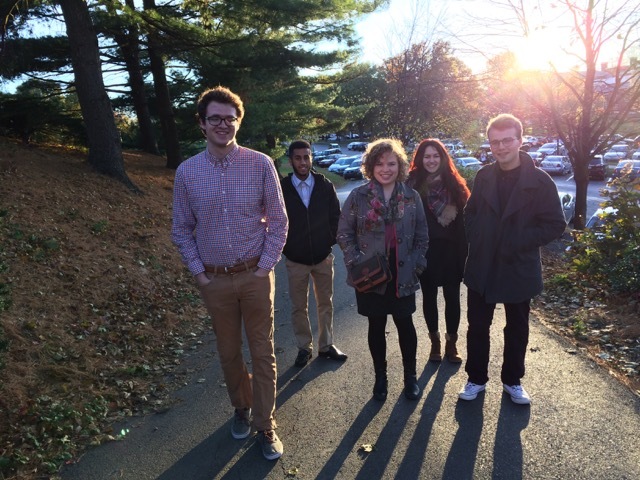 Tawfiq, Caroline, Mila, and Sarah partnered up with members of Gettysburg College for a panel session on how to design a successful undergraduate digital humanities research program. Other attendees at the conference tweeted and commented on how impressed they were with Gettysburg’s and Lafayette’s programs. Afterward, Saturday’s keynote speaker, UCLA professor Safiya Noble, spoke about biases in search engine algorithms at lunch and their effects on the way people perceive race and gender. Her talk illustrated the power of algorithms and information bias in society, and proved the importance of doing good digital scholarship. As the day came to an end, Tawfiq, Caroline, Johnny and I took part in an electronic poster session while academics and other attendees drank wine, ate hors d’oeuvre, and wandered the room to listen to our presentations and others. After packing up our things and going to a panel session Sunday morning, we began the journey back to Lafayette. Although, at times, scholarship can be a strange endeavor, we were excited about the opportunity to present our undergraduate research projects, and the positive feedback we received.